Three chapters of the National Society of Black Engineers (NSBE) are joining forces to inspire the next generation at the group’s NSBE Region 1 East Canada Zone conference, to be hosted at U of T Engineering Feb. 24, 2018. Designed on the theme of ‘Ignite, Imagine, Innovate,’ the one-day event brings together high school students, university students and young professionals for experiential outreach activities, networking sessions, and panel discussions around career development and diversity in the workplace. The day will launch with an opening keynote from NSBE U of T alumni currently working at Shopify and Rangle.io. “The mission of NSBE is to increase the number of culturally responsible Black engineers to excel academically, succeed professionally and positively impact the community,” says Nicole Deterville (Year 3 ChemE + PEY), East Canada Zone secretary for NSBE U of T and co-organizer of the conference. Held during Black History Month, the organizers hope the conference will both inspire high school students to consider pursuing science, technology, engineering and math (STEM) at college and university, and strengthen the NSBE pipeline that will help those students successfully transition into their careers and excel in leadership positions. To do this, Portia, Nicole and Leah Smith, NSBE U of T’s president, are working with NSBE’s provincial chapter and the larger NSBE Region 1 East group. 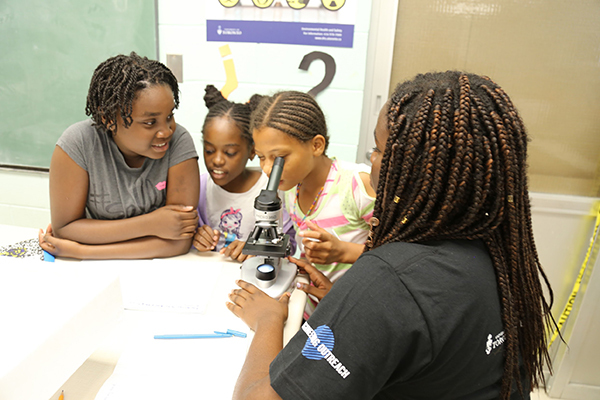 Portia and Nicole have also been instructors in U of T Engineering Outreach’s ENGage program, a week-long summer camp that engages Black students in the Toronto District School Board with workshops and activities designed to ignite a love of STEM. High school students will participate in hands-on activities exploring a wide range of engineering topics led by the U of T Engineering Outreach team. Attendees will be invited from schools in priority neighbourhoods across Toronto, says Dawn Britton, associate director of U of T Engineering Outreach. Connecting with professionals she admires and hearing stories of their journeys to those positions is one of the most enriching aspects of her involvement in NSBE, says Portia, and she strives to share her own story with the students coming up behind her. Register now to attend NSBE’s Region 1 East Conference at U of T Engineering Feb. 24, 2018. Allies welcome.